This course can be taken as a standalone unit or combined with another methodological seminar or any of the methods courses. This course combines the basic concepts of qualitative data analysis with the essential features of NVivo. This is the course you need if you are new to qualitative analysis and want to use NVivo from a methodological standpoint. The course is structured around four modules that follow the logical sequence of the qualitative analysis process. You will learn to: relate epistemology, methodology and methods of qualitative analysis; organise a qualitative dataset; differentiate approaches to coding qualitative data; seek patterns and identify relationships inductively and deductively; generate hypotheses; create second-level constructs; present findings using visualisations; export data; and share projects. The course blends lectures with hands-on exercises in which learned concepts are put into practice. 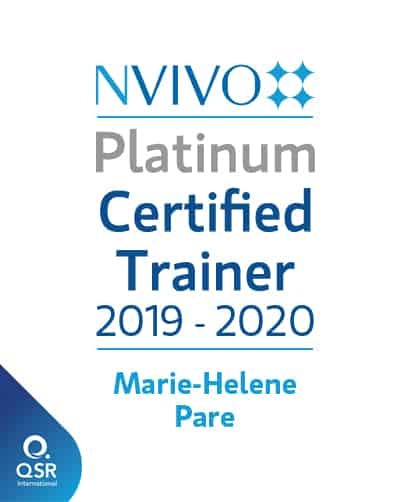 Note that this course teaches only the most salient features of NVivo (for a more comprehensive course on NVivo, see the Introduction to NVivo course. Bazeley, P. (2009). Analysing Qualitative Data: More Than Identifying Themes. Malaysian Journal of Qualitative Research, 2(2), 6-22. Gibson, W. J., & Brown, A. (2009). Working with Qualitative Data. London: Sage. Chapter 1: Introduction: qualitative data analysis in context.